Leaders of Polk Kick-Off Grilling! 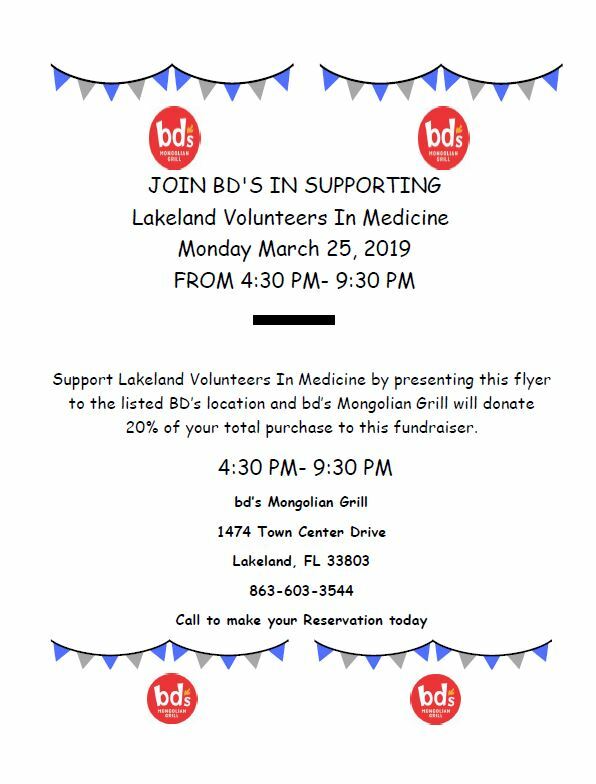 Our Leaders of Polk teams will kick off their fundraising efforts on Monday, March 25th at Bd’s Mongolian Grill at Lakeside Village. The first team will start grilling at 4:30pm and the last at 9pm. Come out and support ours teams by having a yummy dinner and throwing in a nice tip for the guest grillers. A portion of all food sales will benefits LVIM. https://www.lvim.net/wp-content/uploads/2019/03/use-for-promo2-3-21-19.jpg 784 596 sbrowning@lvim.net https://www.lvim.net/wp-content/uploads/2017/08/LVIM-Logo-No-background-1024x468.png sbrowning@lvim.net2019-03-21 14:56:552019-03-21 14:56:55Leaders of Polk Kick-Off Grilling! Lakeland Magic supports LVIM We Are Moving!